We can customize a talk, training or workshop to meet your needs and the needs of your organization. Contact us to discuss this potential. Below are a few examples of programs available. What would More ENERGY Mean to YOU? Your Employees? Your Business? 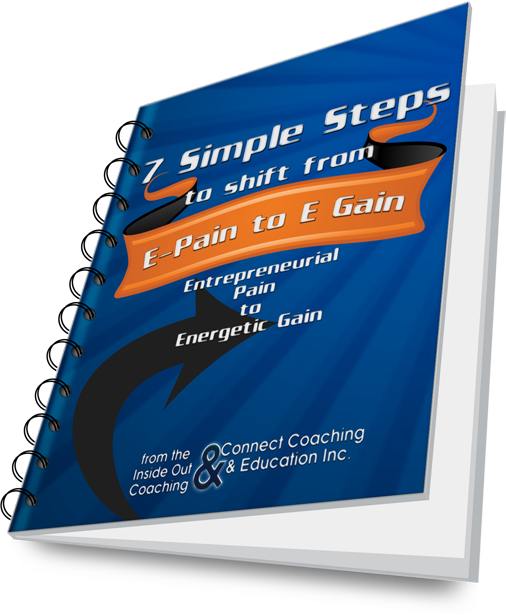 Learn How you Can Leverage your "E-Factor" to level up your business and your life. This is an interactive workshop which introduces a proven 7 step process that will show you how likely you and your business are to experience the success you really want both now and in the future. The CVI (TM) is quickly becoming the "assessment of choice" for many coach practitioners around the world. Most assessments measure at the personality and behavioral level which tends to adapt to any context or life situation. The CVI (TM) measures our innate humanness, the part of us that doesn't change. With a 94% repeat score reliability, the CVI (TM) has captured and quantified what Maslow called the "inner bent", and subsequently, we able to see where a person is wired to operate in their work and in their life and where they will make their highest and best contribution. Cynthia Spradlin | Connect Coaching & Education Inc. is an authorized affiliate and a licensed provider of Taylor Protocols and CVI (TM) Certified Practioner (CCP). You’ll experience the power of the Core Energy Process first hand, connect with other like-minded professionals, and walk away with new skills you can apply immediately to your life, work or business. This 3-day intensive face-to-face weekend of the iPEC program is invigorating and inspiring. It gives you the opportunity to experience the power of Core Energy Coaching firsthand, and provides practical knowledge about how to utilize its potential in many aspects of your life. You’ll learn transformational coaching skills that help you get to the core of belief systems, challenge paradigms, shift energy, and open up infinite new possibilities. You’ll also learn foundational theory and application to move yourself, your teams and your clients forward with clear next steps to form well-thought plans and accountability systems. Most importantly, in all live modules, you’ll coach and receive feedback. This training is invaluable for any leader, manager, business owner or anyone wishing to raise their energy and impact. In this live, in “process,” experience of a lifetime, you’ll quickly see that you can live your strongest best life beginning now.